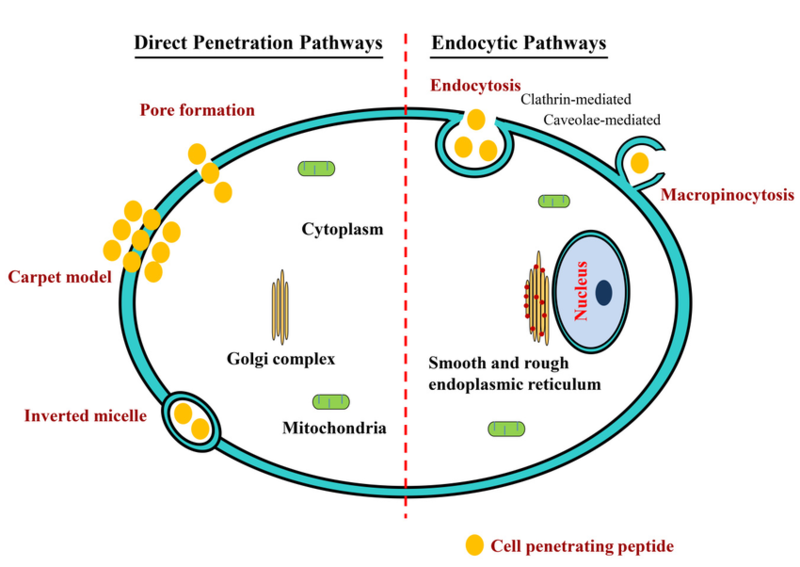 Cell-penetrating peptides (CPPs), alternatively designated as protein transduction domains (PTDs), Trojan peptides, model amphipathic peptides (MAPs), or membrane translocating sequences (MTSs), have the ability to translocate the cell membrane and gain access to the cellular interior. In recent years, cell-penetrating peptides have attracted great interest as drug delivery carriers. They may help to develop new therapeutic agents or cosmetics. In general, compounds with a molecular weight greater than 500Da can hardly penetrate the biofilm. The molecular structure of CPPs is relatively short, consisting of positively charged molecules with less than 40 amino acids. These sequences can carry electrostatic or covalently bound bioactive substances through cell membranes, including plasmid DNA, siRNA, and therapeutic proteins. 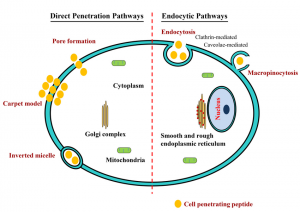 In this case, the mechanisms of cellular internalization may include endocytosis and direct translocation through pores, but researchers are not clear about the factors that induce molecular transport and the corresponding mechanisms. In a recent study, researchers covalently combined a wound healing promoting sequence with cellular osmotic peptides to improve the efficiency of drug delivery through the cell membrane. In the study of cellular internalization, the researchers found that the novel peptides ingested by cells can conjugate into keratin cells and thus significantly improve drug transport under good tolerance. In this study, the researchers analyzed the effect of a novel polypeptide chimera (Tylotoin-sC18*) on wound healing. The results showed that the fusion of peptide with (Tylotoin) did not induce loss of its activity. The researchers also observed the effect of its proliferation on keratinocytes, which may be an important step in wound healing. Tylotoin-sC18* shows strong antibacterial activity and can effectively inhibit bacterial infection in wounds. Because of its multiple functions, the researchers speculated on whether the new polypeptide chimera could be used to treat wound infections in the body; the results are published in the international journal Scientific Reports. 1. Horn, M., & Neundorf, I. (2018). Design of a novel cell-permeable chimeric peptide to promote wound healing. Scientific reports, 8(1), 16279. 2. Langel, U. (2006). Handbook of cell-penetrating peptides. CRC press. 3. Mäe, M., & Langel, Ü. (2006). Cell-penetrating peptides as vectors for peptide, protein and oligonucleotide delivery. Current opinion in pharmacology, 6(5), 509-514.